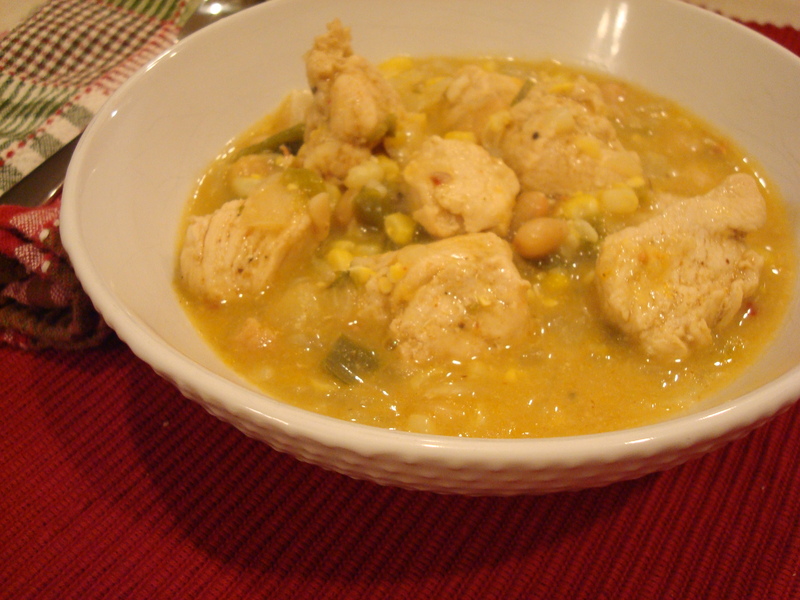 Southwest White Chicken Chili | EASY AS PIE! White chili is not something that ever really intrigued me in the past. It never looks that appetizing in pictures and I always overlooked it. I now realize I was making a mistake. I had no idea what I was missing! This chili, while vastly different from my traditional chili, is very good and very flavorful. It had just the right amount of spiciness from the peppers, creaminess from the soup, and heartiness from the chicken. It is a real winner and I’ll definitely make it again. Heat oil in a deep soup pot over med-high heat. Add the chicken, onions, pepper, and spices. Cook until chicken is cooked through, stirring often. Add soup, water, corn, beans, and chicken stock. Heat to a boil. Reduce heat to low and simmer at least 5 minutes. Taste and adjust seasoning and add more broth accordingly. Can serve with shredded cheese on top, but we didn’t. Trackback: Game Day Grub « EASY AS PIE!